Wall insulation process is very important. As a result of careful insulation of walls significantly reduced the financial cost of heating. The walls are mostly insulated from the outside. For these purposes, are widely used plates from mineral cotton wool and expanded polystyrene. The boards, tools, trowel, measuring tool, cement-glue mixture, the metal or plastic profile, plastic dowel spacers. Before the installation of Styrofoam boards, you must prepare to be pasted on the surface. Clean it from dirt and moisten with water sprayer. Similarly prepare himself pasted material. In plastic container with a stirrer, spread the cement-glue mixture. This compound has excellent ability to stick to any surface. Because of these properties, experts recommend to use it. 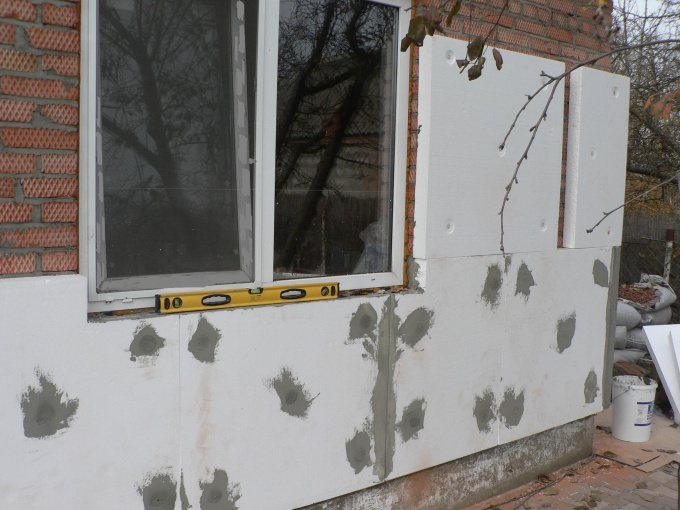 The adhesive is applied on the prepared sheet of polystyrene foam with a trowel as follows: a small amount of the mixture is rubbed into the plate surface in patches, making between them a distance of 20-30 cm and Then at every spot impose a small amount of glue in a kind of "pellet". Attach to the wall smeared with the adhesive sheet and tap the entire surface of the plate with his hand. With the help of special plastic spacer dowels bolt the plate on the surface. 1m2 plate use at least 6 pieces, and with depth of penetration make not less than 5 cm After curing the adhesive (3-5 days) with a foam seal the joints between the boards. Corners of door and window slopes, reinforce with metal or plastic corner profiles. Before drying the reinforcing layer, the polystyrene foam is recommended to protect from direct sunlight and precipitation. The disadvantage of polystyrene foam is a poor water vapor permeability, so the material needs to be protected from the environment by plaster or facing brick.